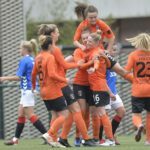 Montrose striker Charlotte Gammie recently picked up the Scotmid SWFL Division 2 Player of Year trophy at the Scottish Women’s Football Awards in Glasgow. 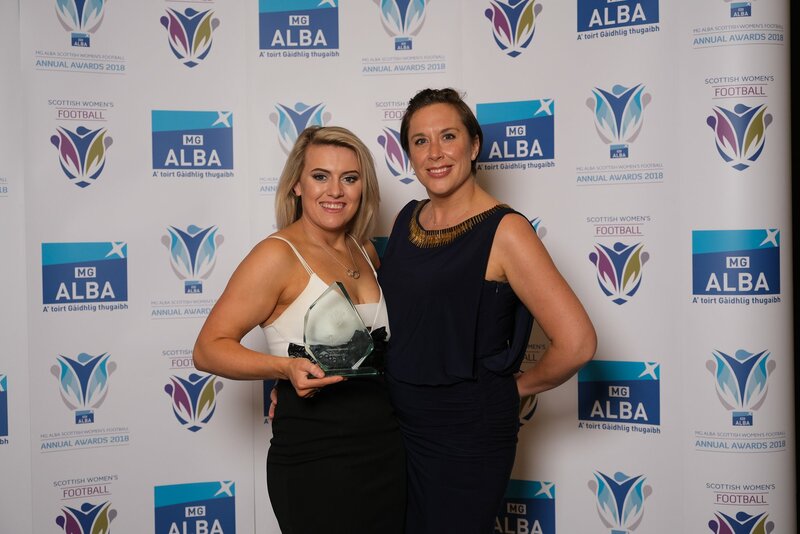 The forward was a vital component in a title winning Montrose side and she was keen to credit her team-mates when looking back on her award win. “I was overwhelmed more than anything. We’re a team from a small town and it’s a huge achievement for all of us. I wouldn’t have done it without my team mates so it’s really an award for the whole team” said Charlotte on her win. Gammie and her Montrose team-mates also enjoyed the awards night in Glasgow. “A few of the team had never been to something as big before so it was great to experience it as a team. 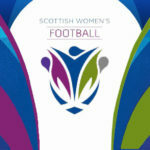 It was a great night and some of the Scotland team being there and being able to talk to them was really good”. As she looked back over the past season the forward was clearly proud of her team becoming champions. “The whole team deserved it, we’ve only been going for two seasons so it’s a great achievement. It was important for us to build on the previous season and maintain the relationships within the team. We had a change of league to cope with as well but we just wanted to prove who we were and put ourselves out there as a team from a small town”. Montrose sealed the title on the last day of the season with a 2-1 victory over second placed Stonehaven. The sides were equal on points going into the final game which set up a nervy ninety minutes. “It was the worst day of life and the best! We had put everything into the Forfar game the week before and we had a few struggling with injuries. We all met up at a cafe to talk it over and start the day as a team and that really helped us face the nerves together”. Gammie scored both goals in the final day win giving her side the title and promotion to SWFL Division 1. Although the race went to the wire, the Montrose striker felt her side deserved it. “We wanted it rather than expected it I would say but I think we deserved it in the end, even though it was really close with Stonehaven”. 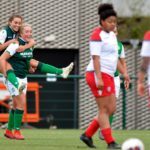 Her double strike in the title-decider took her season tally to an impressive 41 goals which she puts down to hard work with her colleagues on the training ground. “I pretty much doubled my tally for the previous season so I was delighted with that. We had been working more on set-pieces in training and that was the reason I scored more. Our training was much more focussed than the previous year and we worked hard on things at training that really helped put me in the position to score more”. Charlotte also credits her Dad with her improved return in front of goal from the previous year. “My Dad coming in as head coach really improved me as a player and he was able to push me to another level. I really can’t thank him and all the team enough for last season”. Although her Dad is coach, Gammie says she doesn’t get any special treatment. “We keep the two relationships apart but it is different. He knows me really well as a player and knows what I’m capable of which means he gets angrier with me if I don’t do something I should have!”. The hard work on the training pitch paid off come match-day last season and Montrose are already preparing for the next campaign. “Training is vital for working on things you can put into the match and in fairness to the girls, we get good regular numbers for training. It’s a credit to the girls that they get along regularly despite difficulties with work and getting time off. We started back training last week after taking about six weeks off at the end of the season and we’ll just build up as we get closer to the start of the season”. Montrose have started preparing for next season which will see them step up a level, Gammie is sure her side can rise to the challenge. “We’ve played a couple of teams from the new league in friendlies and they were close games so that gives us a good idea where we are”. Stonehaven will join Montrose in taking the step up following some league reshuffling and Charlotte is glad to see last season’s rivals following them in being promoted. “Stonehaven were our rivals all last season and it’s a shame that someone had to miss out when it comes down to the last day. I think it’s good for us that they are coming up with us as it will give us a local rivalry since we have lost the Forfar fixture”. The newly crowned SWFL 2 Player of Year believes that she and her team-mates are ready for the challenges that await in the league above. “It’s not going to be easy, it will obviously be a step up in standard but we are a team that works well under pressure so we know that we can at least give it a good go. I’m really looking forward to it and I’m sure the rest of the squad are too”.